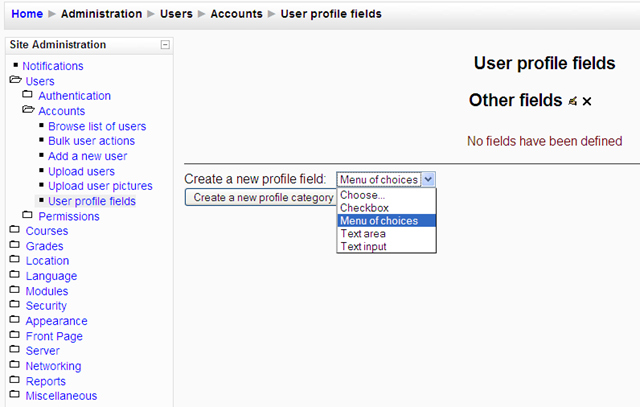 Go to Site Administration > Users > Accounts >User profile fields. A menu of choices allows you to enter the choices that a user will select from a drop down menu. This is a good choice if there is a pre-determined set of possible entries. The text area will give the user a large text box in which to enter information. This is a good choice when the entry is long and will contain much information. The text input field gives the user a much smaller text box to complete their entry. This is good for entries that will be one or just a few words. The size of the text box can be modified for either of the last two choices. Select the type of field you think will be the best based on the scenario described.